That's why I bought one of these... a rubber ruler. Seriously though, it's that time of year when school supplies are starting to pop up in stores and parents can see the light at the end of the Summer tunnel. You can find these more now than you can any other time of year. If you have any vehicles these days and who doesn't, you really need to pick one of these up. I bought a pink one so nobody would steal it from me once they saw how well it worked. It's never been easier to measure just how far it is around the corner of that building with one of these things. And it's not like you're going to get it wrong either, you'll get a perfect measurement each time. You don't have to keep positioning your small ruler and adding up angles and such. It almost makes it more fun to run your tanks all over the place with complete disregard for your troop's safety. A disembarkation template. The idea isn't mine and I've mentioned it before, but it's worth bringing up again. I saw it on The Black Parade a while back and when he revisited it for one of his vehicles. It has it's ups and downs as I found out, but is there anything cooler than this? So there you have it. A rubber ruler and a disembarkation template for your vehicles. I can't think of a reason to play without them honestly. Seriously though, I know there are other great things out there like these two, I just haven't found them yet. But when I do, you can bet that I'll share them just like I've done with these two gems. 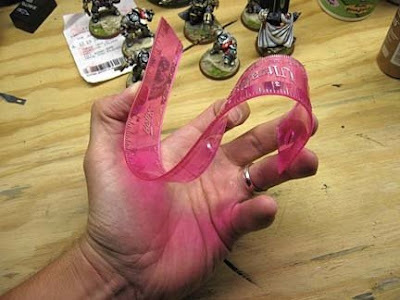 I'll see your rubber ruler, and raise you a cloth tape measure! It's retractable, highly portable, and still measures around corners! Besides online you can find these at Wal-Mart, Hobby Lobby, and fabric stores. I use the red bendy stick from the Black Reach box set, I cut them down, one for movement and one for shooting as pretty much all my Deathwing weapons have the same range. 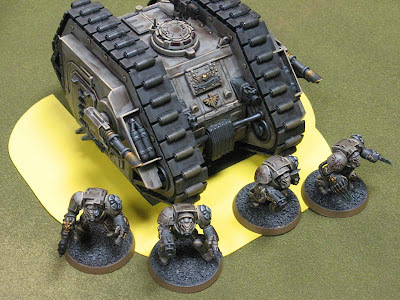 FromTheFang: In dense terrain it can be near impossible to get it in place, but it helps to hold it over like a regular blast template to see if your guys are still disembarking properly. The Inner Geek: Curse you man! I've been foiled again. Gonders: It's flexible but not actually "stretchy." SC John: That is the beauty of Deathwing isn't it... it's 24 inches or nothing. Great ideas, Ron! I'll have to look for that bendy ruler. Honestly, though, I just like looking at pictures of your 1st gen. Landraider. Simple, effective paintjob + subtle updates = understated awesomeness. Or you could use.... a tape measure. More accurate measurement, you can bend it if it's not heavy duty. How many people actually use a smaller ruler and then work out their angles? Again, when a tape measure works fine. I always bring a sewing tape measure along in case I need to bend around corners and such. The template is simply brilliant and I can't wait to make my own! I must confess, I've been using pictures of your 1st gen Land Raider to assist in my scratch build tutorial. It's a great paint job and highlights all the nuances of the model. And I'd agree with some of the people above: you might as well just use a tape measure. The fact that it can bend pretty sharply means that you'll get more movement (albeit a small amount, but everything counts) because you're going along a straighter path. A.D. I use a short, 6 inch ruler for movement so I know the max distance they can move just by setting it next to them real quick with one hand. Kinda like those multi-purpose templates you see sometimes. Krisken: Thanks. It was fun to field during the time that I had it. Reid: Sure, why not? I do it all the time with my guys when I want them to go around an object instead of over it. I mean they have to go around tanks and such right? I've got a swag bag template from an adepticon years ago I use for my 6-inch movement and coherency, but that rubber ruler is in my iphone for my next trip to walmart!!! Another key piece of equipment I've found that is handy to have are destroyed vehicle templates... unfortunately with true LOS now, we almost have to model wrecked vehicles for them. Tim: I've always wanted to make some kind of destroyed vehicle marker myself. Even if it was nothing more than a base with some vehicle parts on it to represent what's left of the vehicle. Something more than just saying there's a destroyed vehicle there. you can find cheaper more solid ones at wal-mart... if your LGS is smart these make great door prizes for tournaments and such. for all your destroyed vehicle needs... the interwebs has all kinds of things.